Registrations will be processed when payment is received. Please understand that part of the economic mission of CSA is to support the efforts of local farmers, and a big part of that support is getting cash into the farmers’ hands during the off-season, to allow for seed purchases and farm maintenance at a time when no other income is coming in. To that end, CSA members are required to pay for the entire season before distributions begin in June. In fact, we prefer that you pay for your entire membership right away. Since that’s not always so easy to do, installment payment plans are available. To inquire about a payment plan, please send an email to info@grandstreetcsa.org with the subject: payment plan. If payments are not received by established deadlines, membership may be subject to late fees or cancellation. All payments for the 2019 season are due by May 15, 2019. Please note that there is a work requirement for this CSA. As an all-volunteer operation, Grand Street CSA relies on the work-contribution of members in order to function. We are using a separate service called SignUp.com to let you pick your own shifts. Every member is expected to sign up for a minimum number of distribution shifts during the season. The total number of required shifts (1 or 2) will be determined after the registration period has closed and is dependent on the total number of members for the coming season. Instructions for fulfilling this requirement will be provided at that time. If you have any questions, please write to info@grandstreetcsa.org. Thanks! Spring is just around the corner! That means farmers are planning for the upcoming season, and it’s time to sign up for your CSA share. The registration form includes important information about our CSA – some is outlined below. We are once again partnering with Norwich Meadows Farm of Norwich, NY. One share is generally enough for a (non-vegetarian) family of two. One share costs $355 for 22 weeks. This price is contingent on receipt of payment by March 15, 2018. After March 15th, one share will cost $370. Any unpaid registrations will be cancelled if payment in full is not received by April 30, 2018. We also have optional add-ons: fruit & eggs. Norwich Meadows Farms sources the majority of our fruit share from Red Jacket Orchards of Geneva, NY. Fruit may also be sourced from other local farms. Our eggs also come from Norwich Meadows Farm. We are asking all members to sign up for at least 2 volunteer shifts and depending on the number of members we may increase that to 3 shifts. Distribution will be on Tuesdays from 5:15pm to 8 pm at the Abrons Art Center. The season begins around the second or third Tuesday in June, weather dependent. Please email us at info@grandstreetcsa.org if you have any questions. Email any questions to info@grandstreetcsa.org, and one of our core members will get back to you. Today is our first Winter Distribution for 2017! Due to truck issues there will be No Farm Bridge shares today. Distribution will be on January 23rd and March 6th. Distribution is from 5:15PM until 8PM at Abrons Art Center. Fruit shares: Please be prepared to haul a lot home tomorrow. We’ll be getting 4 varieties of apples – a double share (~17 lbs) for full shares and a regular share for half shares. The Winter season is significantly different from our Regular season, so please read the following information carefully. Email any questions about Winter Share to info@grandstreetcsa.org, and a core member will get back to you. What is in Winter Share? The Winter Share keeps us supporting Norwich Meadows year round and reminds us that local food doesn’t end with the regular growing season. Shares consist of storage crops, like roots and winter greens, dry beans, and a variety of dairy and value-added products from local farmers. Produce is grown in Norwich, New York. The Winter Season is designed to send the farm crucial startup funds to cover the cost of seed, equipment, repairs, materials, etc. Our Winter pickups are from December through May (6 pick-ups). We offer three (3) types of Winter shares: Lacto-Ovo Vegetarian, Vegan Vegetarian, and Omnivore (see descriptions below). We are also offering frozen shares from The Farm Bridge (formerly Winter Sun Farms). Details below. When do I pick up Winter Share? *In cases of severe weather, members will be notified as soon as possible of changes in the distribution date. We have elected to bypass February distribution due to past difficulties related to severe weather and site logistics. Winter distribution, like the summer/fall this year, will be Tuesday 5:15pm-8pm at the Abrons Art Center. Pick up will continue to be outdoors except on days weather is too severe for either people or vegetables. As during our regular season, due to lack of storage, missed pickups cannot be compensated or refunded. Leftovers will be donated to St. Mary’s Church immediately after distribution. All members will be required to sign up for 1-2 volunteer shifts depending on the number of members. We will contact members after registration closes to confirm the number of required shifts and instructions for signing up. We are offering 3 share options from Norwich Meadows Farm and a frozen share from The Farm Bridge (see below). The LACTO-OVO VEGETARIAN SHARE includes produce, dairy and eggs, no meat. This share weighs about 20-25 lbs per pickup and fills approximately 2-3 regular canvas bags. The VEGAN VEGETARIAN SHARE is a vegetarian share without any animal products, such as eggs, or dairy. This share weighs about 25-30 lbs per pickup and fills approximately 2-4 regular canvas bags. The OMNIVORE SHARE includes produce, dairy, eggs, ground beef and chicken. This share weighs about 15-20 lbs per pickup and fills approximately 2 regular canvas bags. Variety: The items in each share change on a monthly basis and are determined by what the farmer and local vendors have available. In addition to receiving storage crops (carrots, turnips, radishes, beets, rutabaga & other roots, potatoes, onions), hearty greens, and preserved items (frozen squash, tomato sauce, pickled vegetables), locally produced pasta, dry beans & flour may be included. You can see what our sister CSA Washington Square CSA received over a past winter season here. All Norwich Meadows Farm share options cost $305 and includes a $5 administrative fee. All share items, including produce, added value products (e.g. granola, pickles, tomato sauce), dairy, and meat are from Norwich Meadows Farm and neighboring farms. One (1) share provides enough food for 1-3 individuals depending on your diet, goals and cooking style. Animal products have a higher production cost, so even though the three (3) share types have different weights, they are all equal in value. The Farm Bridge Shares partners with local sustainable farms to supply a winter share of great tasting frozen fruits and vegetables all winter long. Their goal is to deliver a superior product at a fair price for you and the farmer. The registration Deadline for Farm Bridge is December 1st. Extras are optional, but you must register for a Vegan, Lacto-Ovo, Omnivore or Frozen share in order to get extras. The registration form will open soon. Payment must be received by Wednesday, November 15th. We are offering, apples, and apple cider as extras. Because our vendors require a minimum purchase, availability and cost will depend on interest. If we are unable to meet the minimum order for any of these items, you will receive a refund for any extras we are not able to purchase. We’ll share info on Fulton Fish Market shares, smoked salmon and Lewis Waite Farms when available. Email any questions about Winter Share to info@grandstreetcsa.org, and one of our core members will get back to you. First time ordering? Register, sign-in and order here. Remember to place your orders in the next couple of days for the CSA pickup on Tuesday, September 5th! We hope everyone is enjoying their peppers, eggplant, cucumbers, corn, onion, carrots, squash, and beans from Tuesday. 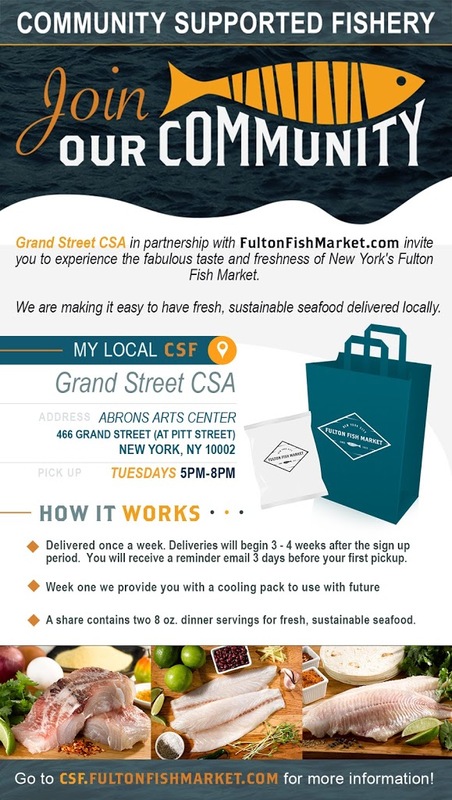 Opportunity for CSA members to join FultonFishMarket.com’s Community Supported Fishery! Each share contains two 8oz servings of fresh, sustainable seafood. Delivered once a week (during our regular share pickup). Deliveries begin 3 to 4 weeks after sign up period. You will receive an email reminder 3 days prior to the first pickup.